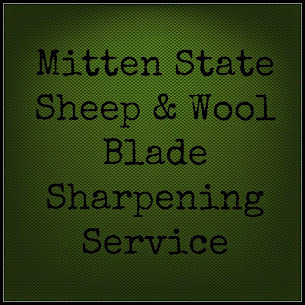 Mitten State Sheep & Wool : The Simple Life? I am going to admit, there are days when I could turn in my barn boots for a pair of flip flops. There are days when I wonder why they call this the "Simple Life". Days when I wonder if this is really the life for me. We have had some of those days recently. Our first cut of hay looked very promising this year-enough hay to take us through the winter if need be, or better yet sell it, to pay back some of the money we have put into this field. Reality: RAIN! RAIN! RAIN! Now we will be lucky to sell it as steer feed or garden mulch. You know those lambs we separated from their dams a couple of weeks ago? After a week, when things had quieted down, I looked out in the field and seen the blue gate open on the corral...sigh....all of the lambs were out. Which means, putting aside what was planned for that day, to gather all of the sheep up, and go through the process of separating lambs and ewes again. Thankfully, the second time went pretty well (if you discount the mud from all of the rain) and we were able to get the lambs ready for a couple of scheduled farm visits. We feel very blessed to have a healthy, beautiful flock of sheep. But, even with the best sheep, there will be issues. 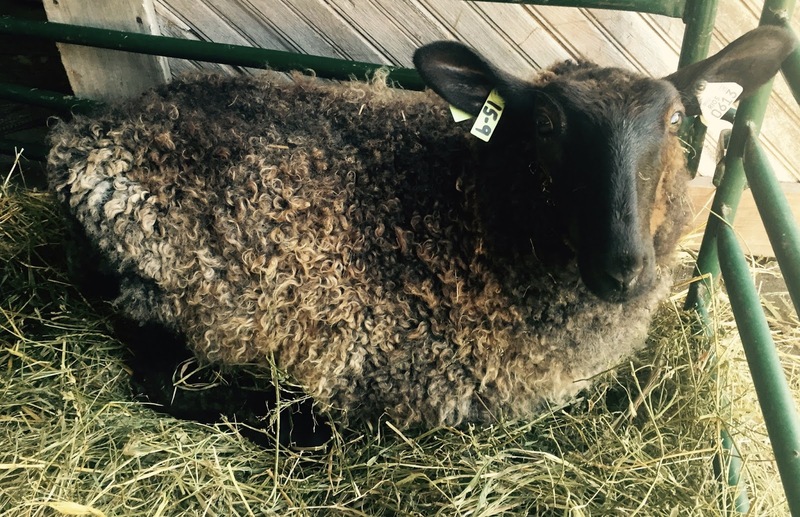 This week, we had one of those issues with one of our purchased ewe lambs. Fly Strike (which I will post about later) is one of the most unpleasant things to have to deal with when raising sheep. Thankfully, we have only had it a couple of times, over the years, but once is too many. She seems to be recuperating, and we are hopeful that she will pull through. When raising livestock, you have to do some downright disgusting things. You also have to deal with loss no matter how well you take care of your animals. If you throw in a goat kid eating the leaves off of some new fruit trees, getting chased by our Tunis Ram, and all of our undone chores due to rain, you have my week in a nutshell. I love the photos of the cute farm babies, the baskets full of fresh eggs, the jars of fresh milk, and the fields of hay as much as the next person, but, there is a lot that goes on behind the scenes. I almost didn't post, and went through the week silent. But then decided, this blog is our farm journal, and this is a big part of it. Will I trade my barn boots in? Probably not! I figure I would just be trading in one set of challenges for another. But, I could use a few days in flip flops! Oh dear! I know exactly what you are talking about. I told my daughter just yesterday that if I didn't have to go to work and could stay at home taking care of things I would still be busy all day every day just keeping up with everything that goes wrong! I just don't want to give up and be one of those people who "used to.." So many people give up. Don't you! Thankfully, these weeks are not typical. I do like to read the true reality of homesteading. It has ups and downs, and in betweens. We gave our goats new homes, and it feels so empty here now. Maybe down the road, we'll be raising them again. Yes, that can be hard rehoming animals. I hope you were able to get your hay in. We are hopeful that second cut will be better. Just hoping for three days without rain. I never really wanted any flip flops, Sandra, but sometimes you have to stop and wonder why we raise all of the animals we do. Hang in there, you know it will get better, and besides that, you really do enjoy your sheep. It shows in how you talk about them. It's a great life, even with all of it's ups and downs. Weeks like this are not typical (thank goodness) but when they come, it is a challenge. But, I agree, it is a great life. A drought is awful!! I hope you get the rain you need. It's good to hear your reality Sandra..it makes the happy posts all the happier. I remember the month we moved into my parent's small holding..that had been occupied by a pig and free range chicken farmer..we had kept horses for years but the plan was to buy a couple of weaners to breed from and a dozen or so calves for mum to rear....it was December and it didn't stop raining for around 6 weeks!! There were no hard paths..the previous owners pigs had been allowed to forage and root just about everywhere..so the land was a quagmire and my little mum had to push the barrow full of chicken feed through solid soup every day..rats were everywhere!! Christmas morning I went with my dad to see if there were any eggs from any of the 500 hens..unlikely but just possible..A victory cry as we found just one..followed by gails of laughter as after glooping our way back the the kitchen..my father removed his boots and sat on the one egg he'd slipped into his pocket!! Later that day we all sat down to Christmas dinner in the draughty, very tumble down cottage and heard the sound of galloping hooves on the road!! All of our ponies and horses had broken out of the broken down wire fencing..and were heading off to the nearest village!! What a day to remember!! These are tiny hiccoughs and not anywhere near so bad as illness which of course came later along with all kinds of serious sometimes heartbreaking sadness.. The disasters all seem to add to the rich patina..without them it might indeed be easier but we wouldn't be who we are! Warts,scars and all! Oh my goodness-what a time!! My trials are simple compared to those!! I agree, trials and challenges will come no matter where we hang out hat at night! Thank you for sharing! Aw, sorry for your week, Sandra. I think it's normal to feel that way now and then. And hey---who doesn't like a relaxing day at the beach anyway? Sandra, thank you for your thoughtful, insightful post. I appreciate your honesty and forthrightness on this subject that I am in a constant state of desire for knowledge of. After reading the 5 comments that preceded mine, I realize that I have such a limited knowledge of homesteading, shepherding, etc. It is just not as simple as "the grass is greener on the other side", but trying to find that precious balance in your desire to live the type of life you really want. In the meantime, I'll continue to join you and so very many others in loving the photos of the cute farm babies, the baskets full of fresh eggs, etc. And I'll continue to be very grateful for all of the homesteading and shepherding bloggers who so kindly share glimpses of their world with people like myself. I hope you will soon have a few precious "flip flop days" to enjoy! Thank you for commenting. I was reluctant to post, but decided to share the other side of things. It is all a part of it. Thankfully those moments with new lambs, making ice cream with fresh milk, etx. Make it all worth it! Not simple and not quiet either. :) People come out to the farm and say "I would love to have this..." But they don't realize it takes hours of mowing and fence building (and mending) for a field to look like that. You rarely get to sit on the porch and just enjoy it. But that's ok, we learn to enjoy in the minute. And savor the sweet times because we know how challenging the not-so-sweet times are. Never trade in the barn boots!!! Thanks for sharing on the (mis)Adventures Mondays Blog Hop. I can't wait to see what you share this week!